ABC NewsFirst Lady Melania Trump during an interview with ABC News. 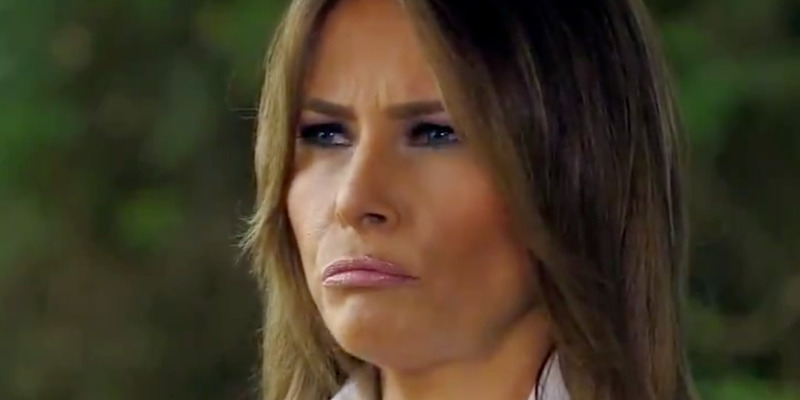 First Lady Melania Trump says she does not always see eye-to-eye with her husband, President Donald Trump, regarding his inflammatory tweets and verbal attacks he routinely launches at people the president perceives as his political opponents. She commented on that during an ABC News interview that aired Friday night. Mrs. Trump is spearheading an anti-bullying campaign called “Be Best.” She acknowledged that her husband’s verbal broadsides contradict the principles of her anti-bullying initiative. She says the president did not try to stop her from launching her campaign. First Lady Melania Trump says she does not always see eye-to-eye with her husband, President Donald Trump, regarding his inflammatory posts on Twitter. Trump, who is spearheading her “Be Best” initiative to “take responsibility and help our children manage the many issues they are facing today,” acknowledged that her husband’s rhetoric on Twitter vastly differs from her campaign’s theme. The president has published a tweet nearly every day after taking office. Frequently, those message are meant to disparage political opponents, which sometimes include derisive nicknames. Despite the stark contrast between the president’s Twitter habits and Melania’s anti-bullying initiative, she claimed that he did not try to stop her from launching her campaign. For her “Be Best” initiative, Melania partnered with the US Agency for International Development and made a solo trip to hospitals in Ghana, elementary schools in Malawi, and an elephant orphanage in Kenya. “BE BEST will champion the many successful well-being programs that provide children with the tools and skills required for emotional, social, and physical health,” a campaign statement said on its website.